CodeBreakers really has made a huge impact here at our school and in such a short space of time! A real success story! I am so pleased with the team, who really have embraced CodeBreakers and moved their teaching and learning on accordingly! Thank you again for all your training and support with this! We are very impressed with CodeBreakers and we are grateful to you for considering us as part of your pilot work! We will all look forward to seeing the end of year results. CodeBreakers is a a really valuable project with some exciting information produced. And….most importantly…some successful children who are far more confident and happy in their approach to learning! Thank you once again! Georgina has been a god send and a guiding light for our child. We were severely let down by our local education providers. Georgina is helping to build our child’s confidence in her own abilities and education in general after the terrible way that she was treated and made to feel less than useless. I cannot recommend Georgina highly enough. She’s actually looking forward to school these days because she knows that something is being done. I have started using elements from the programme to get used to it and find it really easy to follow. It is also incredibly adaptable by a specialist to ensure quality specialist lessons. This is a great resource. I can see how support staff can easily use it. It can be used in whole class approach, small groups and sent home to parents for additional practice. The multi-sensory approach gives phonics an extra dimension and the games can be great fun to use at home. Georgina was very approachable, swift to respond, willing to tailor a package to suit my needs and parental needs, sent me exemplar assessment and reports …. and came in at under half the price of the Local Authority’s ‘cheap’ deal and other well known companies like Dyslexia Action. She communicated with me and then the parents, finding mutually convenient times to assess. She was very clear on what she could offer. Parents were very pleased. The reports we received were thorough, could be used for exam concession applications and also for a teaching tool in school. 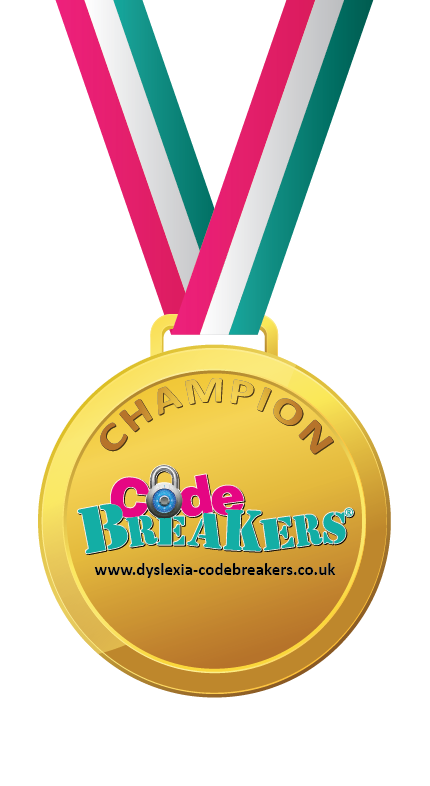 I have already recommended Dyslexia Codebreakers to others! Hi, just to let you know that my student is coming to the end of the first series of CodeBreakers and Mum is so impressed with how it’s going, she should be getting in touch with you soon for series 2. My student is a very bright little boy and he’s focusing for a full hour (he likes the idea of breaking codes!). It has just arrived! Many thanks – just having a good look at it. First impressions… it’s fantastic! Feedback from the learners I use it with is very positive – they love the variety of activities, particularly the dice games! I find it very easy to use and it is versatile too as a specialist using it. Really pleased it is going well! They love the activities and structure CodeBreakers gives, I then supplement CodeBreakers with other things – functional skills, English and phonic comprehension. It is the CodeBreakers they prefer and they are making progress! My students are definitely more willing to have a go, especially in other lessons. Also, willingness to access specialist tuition and wanting to learn! The CodeBeakers ‘How to’ videos are very clear and easy to follow – just the right length. A snapshot of each element that they can go back and refer to. I like! Well done – that will be loved!